Looking for a new restaurant in Leeds? Situated opposite the Corn Exchange is Call Lane's newest member, Red's. 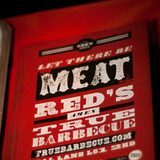 As it's a new restaurant in Leeds, I didn't know what to expect, but Red is correct when he says that 'the people of this island knew nothing of true barbeque'. Obviously I've had home barbeques, the black sausages and the suspiciously cooked chicken, but this was entirely different. It was the true barbeque experience. The menu offered a wide range from beef and pork ribs, to slow cooked pork and barbequed chicken. You could even order a whole hog roast for an advanced booking, a great idea for a party, but somewhat out of my student price range. Other than that exception, the dishes were well priced and each main came with a choice of two sides, ranging from salad to macaroni cheese. As you can imagine, you get quite a lot for your money. But, yes, it's not always about the quantity - although it is often a factor to consider - luckily the quality of the food was remarkable. After some time mulling over all my options, I ordered the pulled pork with slaw and crackling, and a salad and chips for my sides. With the different barbeque sauces drizzled on top, which you find in a selection on your table, the dish was lovely. I just couldn't get over the quality of the food for the price. Several of my friends tried out the ribs, both the pork and the beef, and they were also pleasantly surprised by the quality. All seven plates were left with just the odd scrap, all seven students were left with the inevitable meat sweats. As much as I enjoyed the food, the service was somewhat slow, but it seemed understandable. The tables were bustling with happy diners coming and going, and the restaurant was at the point of full capacity, so I can forgive a slightly slower service when the restaurant is lively and the food is delicious. Red's is a great addition to Call Lane and a recommended place for quality and quantity at a reasonable price. It's not only bustling on an evening but a great place for sandwiches or a cheeky decadent lunch. There's no denying that it's the true barbeque experience. Why? For the true barbeque experience.